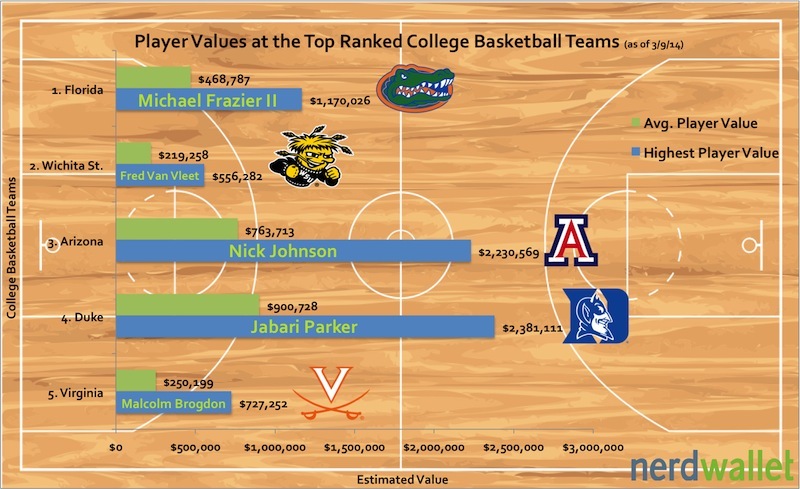 March Madness 2014: How Much are College Basketball Players Worth? Get your brackets ready: March Madness is right around the corner, which means everyone in your office or at your dorm is about to become an expert on college basketball. But while everybody is discussing tournament seeds and zone defenses, we at NerdWallet wanted to examine the players’ financial values to their schools. 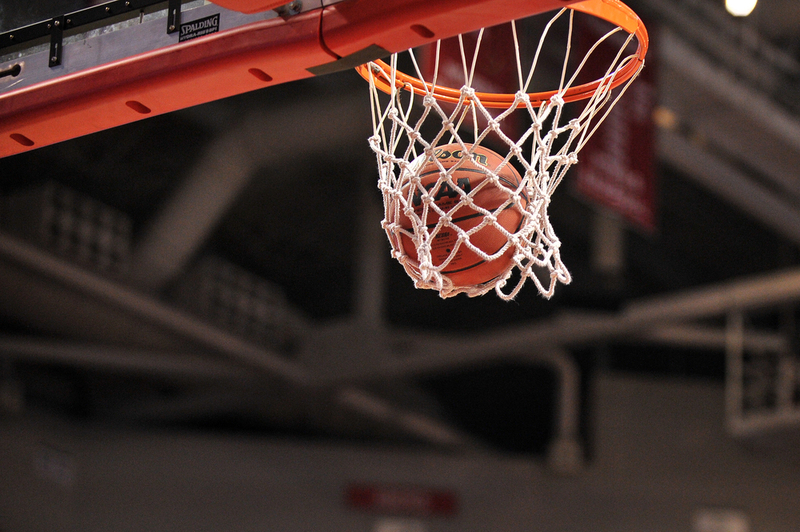 It’s no secret that the NCAA and its member colleges and universities reap huge revenues from the annual men’s basketball tournament, while imposing rules that limit player compensation primarily to the athletic scholarship their schools gave them. Indeed, the issue of whether student-athletes should be paid for the value they create is hotly debated. In advance of this year’s tournament, NerdWallet took a look at how much college basketball players are actually worth to their respective schools. We’re not advocating that student-athletes be paid—this is a complicated subject with arguments to be made on both sides. We simply wanted to explore how much value they bring to their colleges. To do this, we applied a revenue-sharing model similar to the one in place in the NBA, where at least 49% of the league’s revenue goes to players in the form of the salary paid them by their team. We looked at the Associated Press’ ranking of the top 25 men’s college basketball teams in the nation as of March 9, and applied the NBA model to the revenue earned by each team—through TV deals, ticket sales, merchandising and more—in 2012-13. The average player value at each school was calculated by dividing the player revenue total (49% of each team’s total revenue) by the number of players on a roster. The average player on a top 25 team is worth $476,957. For perspective, that figure is just below this season’s minimum salary in the NBA. The average player values as listed in the table above assess how much players would be worth at each of the 25 schools under a revenue-sharing model similar to that of the NBA. Diving further into the true value provided by specific players, we attempted to measure how one’s on-court performance would affect his monetary worth under the adopted revenue model. We measured how valuable a player is to his team by calculating his win shares as a percentage of his team’s total wins. We then crunched the numbers to apply that percentage to a team’s projected player revenue to estimate how much each player on a roster would earn based on his win shares. In this scenario, players are essentially being paid for how well they’ve performed this season. Of course, it’s important to note that there are several limitations to this method of assessing player value. First and foremost, statistics like win shares are not the only measure of a player’s value. Second, most teams would earn significant revenue regardless of the names on the roster. For example, the Duke basketball team would likely generate substantial revenue even if star freshman Jabari Parker—likely to be a top pick in the 2014 NBA draft—weren’t suiting up for them. However, win shares is a good representation of a player’s contribution to his team, and our analysis here assigns salary figures based on performance and relative value. Check out our video at the bottom of the page. The highest-value player at each school is listed, along with his worth. Michael Frazier II has the most win shares for No. 1-ranked Florida and is therefore projected to have the highest player value on his team—just shy of $1.2 million. Meanwhile, last year’s NCAA tournament darling, Wichita State, is undefeated and ranked No. 2 in the country. The team’s total revenue, however, is much smaller than that of most of the other schools, so their most valuable player, Fred Van Vleet, is worth just $556,282. It’s not too surprising that Parker holds the highest value of all players among the top five teams. Duke is a perennial powerhouse, and Parker is one of the best freshmen in the country and a player NBA teams have been eyeing for years. A few other freshmen whose teams aren’t included in the graph above also are worth a great deal of money, according to the numbers. Kansas has two star freshmen who would be at the top of NBA teams’ wish lists if they declare for the 2014 draft: Andrew Wiggins and Joel Embiid. Wiggins is worth some $1.5 million for Kansas, while Embiid is projected to be worth about $1.2 million. Video: How Much Are College Basketball Players Worth? Team revenue data were obtained from the U.S. Department of Education. Roster information and statistics were obtained from Sports-Reference.com.